The Metal Man Inverter Powered Multi-Process 220iDV is a dual voltage, portable DC inverter wire feed welder capable of welding with solid wire (with shielding gas) or with flux core wire. It comes ready to accept part number EZFSG2 optional Spool Gun for welding aluminum. 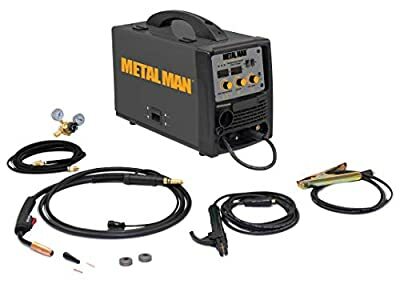 This machine also has smooth DC stick capabilities and the ability to perform lift start DC TIG welding on steel and stainless steel materials with part number ACTT1, the optional TIG Torch. This Metal Man Inverter Powered Multi-Process 220iDV is capable of MIG welding 5/16? steel in a single pass while using 220V input power (3/16" steel when using 120V input power). It uses leading edge Inverter Technology to provide high quality welds that are crisp, clean, and consistent. Stick weld with electrodes up to 5/32? with this exceptionally smooth DC stick welding output. Stick weld on materials such as steel, stainless steel, cast iron, hard facing and aluminum. This unit is an exceptional multi-process machine. Typical applications for include home/hobbyist, construction, auto repair, farm and ranch and light industrial applications.